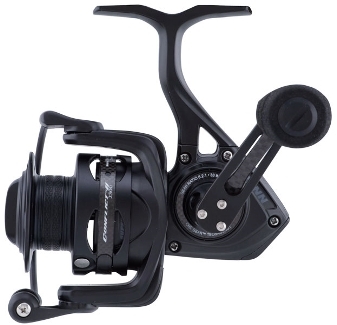 The Conflict II is Penn’s lightest spinning reel. The company was founded in 1932 and has made a good number of spinners. A “rigid resin” body and rotor keeps the weight down, and the reel is 20 percent lighter than the previous, original version. Introduced in October, the Conflict II is meant for inshore fishing, and the series doesn’t include larger reels that Penn usually includes in a series of spin-fishers. One review noted that the reel could also be used for freshwater, of course, saying the sizes can cover catches from trout in a brook to striped bass and blues on the ocean. It comes in six sizes for 2-pound mono or 6-pound braid to 20-pound mono or 40-pound braid. The gears are machined from “the strongest materials for ultra-tight tolerances,” Penn says. That creates, strength, durability and smoothness, it says. Smoothness helps you feel every bump and bite, the company adds. The reel includes Penn’s Versa-Drag System that’s the same system in Penn’s famous International line of big-game reels. The drag in Internationals is simply the best. For more details about the Conflict II, visit Penn’s website and also watch a video.